From BBC Radio 4's The Archers, Jennifer Aldridge (nee Archer) has lived in Ambridge most of her life, and has gained a reputation for entertaining in style at Home Farm. Here she shares over 150 of her favourite recipes with you, and invites you to take a dip into the lives and foods of your favourite characters as you sample the real flavor of rural life throughout the seasons. 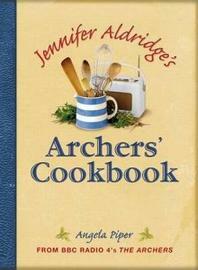 Jennifer Aldridge's Archers' Cookbook takes a season-by-season tour of the kitchens of Ambridge: Spring - this chapter includes recipes such as Jill's cinnamony hot cross buns, Lilian's posh fish pie and Rosie's rock buns, Freda's rhubarb and ginger crumble and Pip's quick-fix spicy stir-fry. Summer - delicious recipes abound in this chapter from Clarrie's famous fruit cake and Pat's almond loaf to the popular nineteenth-century recipe; ham loaf with green peppercorns and creamy piquant chicken made with Helen's Borsetshire Blue. Autumn - as the weather gets colder these recipes will inspire you: Keeper's Cottage casserole, Tom Archer's mustard crusted ham, Pat's walnut bread, Ruarri's favourite toffee apples and good old-fashioned bread and butter pudding. Winter - imagine the frost across Bridge Farm's root crop as you read these winter recipes that include: Home Farm venison and pheasant casserole, ginger tipsy trifle, farmworker's warming winter soup and Walter Gabriel's gingernuts. Picture the seasons in Ambridge as you read these recipes and capture the feel of the village through its enticing aromas and tempting treats. Be prepared to pick your way over the yard at Bridge Farm for some of Tony's muddy, crunchy, organic vegetables. Borrow a bicycle and Lynda will lead you to discover the tenderest green shoots for springtime salad. Or just pack up a picnic and laze under the willows on the banks of the gently flowing Am. Pull on your wellies, pick up a basket and join Angela on a seasonal walk through the delightful Borsetshire village of Ambridge. Rose tinted misty memories of days gone by intersperse the recipes and hark back to life in the village, fondly remembering some of the residents of the past. With collected sayings and country wisdom from the pen of Jennifer herself, Jennifer Aldridge's Archers' Cookbook is more than a collection of recipes - it's a personal invitation into the lives of Britain's favourite countryside characters. Angela Piper has played Jennfier Aldridge in The Archers for over 40 years. Here she brings together her love and knowledge of the radio show with her skill in the kitchen. Her other titles include Jennifer Aldridge's Archers' Cookbook (David & Charles, 1994) and The Archers' Pantry (Ebury, 1997). Angela lives near Felsted, Essex.